Click here for 19 full quotes from Barack Obama in the book Barack Obama in His Own Words, by Lisa Rogak. This book is how political authors SHOULD write books -- stick to the issues, and leave out the horserace and the politicizing. Rogak has written several others in this same series: Howard Dean In His Own Words; Michelle Obama In Her Own Words; and Colin Powell In His Own Words. Presumably more in this series will be forthcoming; we recommend them all (and we will excerpt those which deal with presidential contenders!). Commitment to diversity by CEOs is advisable. Pass ENDA and expand hate crime legislation. Opposed 1996 Illinois DOMA bill. Cut banks out and add $4.5 Billion to college loans. Health Care for Hybrids proposal for fuel efficiency. U.S. needs to ameliorate trade relations with China. U.S. funds for humanitarian aid to Darfur. Bush administration has done �great damage� to U.S.
Curing AIDS must be all-hands-on-deck effort. Homeland security must protect citizens, not intrude on them. Personal privacy must be protected even in terrorism age. America must practice the patriotism it preaches. Protecting nuclear power plants is of utmost importance. Embrace Christ as an ally. A reformed smoker but occasionally burns one. Issue of race has given Senate a black eye. We did the right thing in Afghanistan. Saddam is a tyrant but not a national security threat. 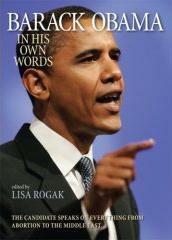 by Barack Obama, edited by Lisa Rogak.